Day: Saturday, March 3, 2018 NOTE: this event has already happened, find current-year events on the events page. We had speakers from the Sierra Club, Duke Energy, Southern Alliance for Clean Energy and the Solar Shepherd. We had two dealerships participating in ride and drives including one new and one used dealer who specializes in EVs. We also had elected officials from the cities of Tarpon Springs, New Port Richey and Largo come out and speak. We also had Solar United Neighbors come to table about solar co-ops. We also had a booth from an electric cart shop and the City of Largo brought their wrapped LEAF. The event was publicized via Facebook and digital mail distributed through Sierra Club and SACE's distribution lists for the area. Many families/participants came out that day took test drives and spoke with the over 20 drivers who brought their cars out. 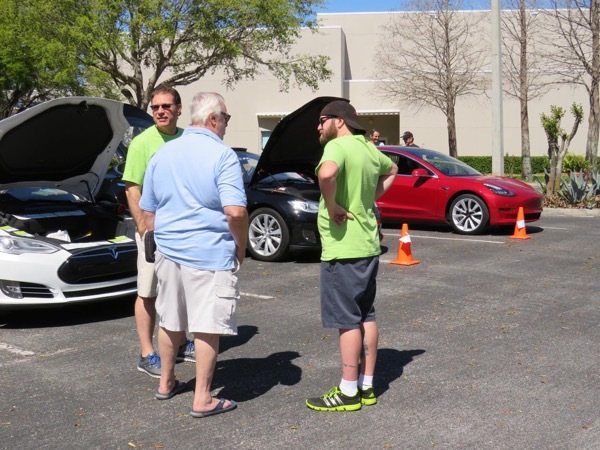 We also had the South West Florida EV Owners club come out and share about their EV club. Jason Cassie and Paul Fosse of the SWFL EV Owners stand in front of some Tesla models. Would you like to drive an electric car? Electrify the South, the Suncoast Sierra Club and The Solar Shepherd, Inc. are hosting an "Electric Vehicle Ride and Drive". The event will take place on March 3, 2018 from 11AM-3PM. Come out and learn about the fun (and savings!) of driving electric. Ride and Drives will be available by registering with local dealership tables at the event. Electric vehicle owners will be showcasing their electric vehicles and sharing their experience of driving electric. We will also have demonstrations on how to charge your electric vehicle and how to use apps to find charging locations. This fun event will be a hands on way to learn about the latest technology! Mark your calendars for Saturday, March 3rd and register by clicking the blue button at the top of this page to bring out your electric ride and enjoy the day with fellow EV owners and future owners! Registered attendees report 745,751 electric miles driven.